The free data.table R tutorial explains the basics and syntax of the data.table package for R. Master the data.table syntax now. This data.table R tutorial explains the basics of the DT[i, j, by] command which is core to the data.table package. If you want to learn more on the data.table package, DataCamp provides an interactive R course on the data.table package. The course has more than 35 interactive R exercises - all taking place in the comfort of your own browser - and several videos with Matt Dowle, main author of the data.table package, and Arun Srinivasan, major contributor. Try if for free. If you have already worked with large datasets in RAM (1 to more than 100GB), you know that a data.frame can be limiting: the time it takes to do certain things is just too long. Data.table solves this for you by reducing computing time. Evenmore, it also makes it easier to do more with less typing. Once you master the data.table syntax from this data.table R tutorial, the simplicity of doing complicated operations will astonish you. So you will not only be reducing computing time, but programming time as well. Where we subsetted the data table to keep only the rows of the 10th Month of the year, calculated the average AirTime of the planes that actually flew (that’s why na.omit() is used, cancelled flights don't have a value for their AirTime) and then grouped the results by their Carrier. We can see for example that AA (American Airlines) has a very short average AirTime compared to AS (Alaska Airlines). Did you also notice that R base functions can be used in the j part? We will get to that later. The ‘i’ part is used for subsetting on rows, just like in a data frame. But you can also use column names, as they are evaluated in the scope of DT. Notice that you don’t have to use a comma for subsetting rows in a data table. In a data.frame doing this DF[2:5] would give all the rows of the 2nd to 5th column. Instead (as everyone reading this obviously knows), we have to specify DF[2:5,]. Also notice that DT[,2:5] does not mean anything for data tables, as is explained in the first question of the FAQs of the data.table package. Quirky and useful: when subsetting rows you can also use the symbol .N in the DT[…] command, which is the number of rows or the last row. You can use it for selecting the last row or an offset from it. The ‘j’ part is used to select columns and do stuff with them. And stuff can really mean anything. All kinds of functions can be used, which is a strong point of the data.table package. Notice that the 'i' part is left blank, and the first thing in the brackets is a comma. This might seem counterintuitive at first. However, this simply means that we do not subset on any rows, so all rows are selected. In the 'j' part, the average delay on arrival of all flights is calculated. It appears that the average plane of the hflights dataset had more than 7 minutes delay. Be prepared when catching your next flight! When selecting several columns and doing stuff with them in the 'j' part, you need to use the ‘. ()’ notation. This notation is actually just an alias to ‘list()’. It returns a data table, whereas not using ‘. ()’ only returns a vector, as shown above. Another useful feature which requires the ‘. ()’ notation allows you to rename columns inside the DT[…] command. Of course, new column names are not obligatory. Here we took DT, selected all rows where the carrier was AA in the 'i' part, calculated the average delay on departure and on arrival, and plotted the time of departure against the delay on departure in the 'j' part. To recap, the ‘j’ part is used to do calculations on columns specified in that part. As the columns of a data table are seen as variables, and the parts of ‘j’ are evaluated as expressions, virtually anything can be done in the ‘j’ part. This significantly shortens your programming time. The final section of this data.table R tutorial focuses on the ‘by’ part. The ‘by’ part is used when we want to calculate the ‘j’ part grouped by a specific variable (or a manipulation of that variable). You will see that the ‘j’ expression is repeated for each 'by' group. It is simple to use: you just specify the column you want to group by in the 'by' argument. 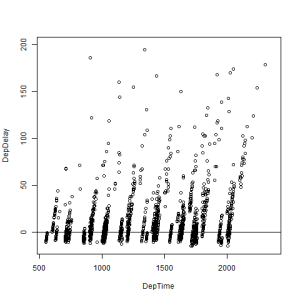 Here, we calculated the average delay before departure, but grouped by where the plane is coming from. It seems that flights departing from HOU have a larger average delay than those leaving from IAH. Just as with the 'j' part, you can do a lot of stuff in the 'by' part. Functions can be used in the 'by' part so that results of the operations done in the 'j' part are grouped by something we specified in the DT[…] command. Using functions inside DT[…] makes that one line very powerful. Likewise, the ‘. ()’ notation needs to be used when using several columns in the 'by' part. Here, the average delay before departure of all planes (no subsetting in the 'i' part, so all rows are selected) was calculated first, and grouped secondly, first by origin of the plane and then by weekday. Weekdays is False in the weekends. It appears that the average delay before departure was larger when the plane left from HOU than from IAH, and surprisingly the delays were smaller in the weekends. Here the subset of planes flewn by Delta Air Lines (selected in 'i') was grouped by their origin and by Weekdays (in 'by'). The time that was compensated in air was also calculated (in 'j'). It appears that in the weekends, irrespective of the plane was coming from IAH or HOU, the time compensated while in air (thus by flying faster) is bigger. There is much more to discover in the data table package, but this post illustrated the basic DT[i,j,by] command. The DataCamp course explains the whole data table package extensively. You can do the exercises at your own pace in your browser while getting hints and feedback, and review the videos and slides as much as you want. This interactive way of learning allows you to gain profound knowledge and practical experience with data tables. Try it for free. Hopefully you know understand thanks to this data.table R tutorial the fundamental syntax of data.table, and are you ready to experiment yourself. If you have questions concerning the data.table package, have a look here. Matt and Arun are very active. One of the next blogposts on the data.table package will be more technical, zooming in on the wide possibilities with data tables. Stay tuned!